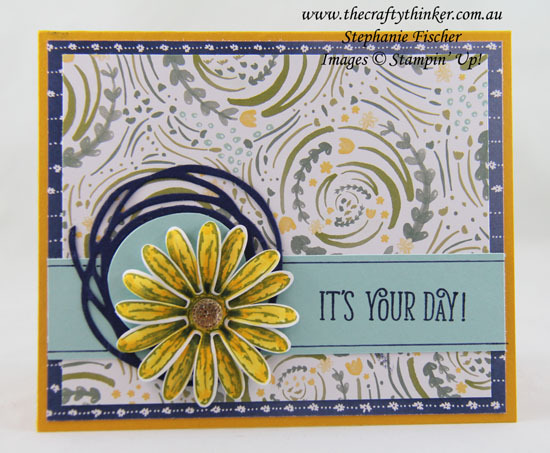 Welcome to the Crazy Crafters' Blog Hop with our Special Guest stamper, Holly Stene - we are thrilled to have Holly join us this month and so excited to CASE (Copy And Selectively Edit) any project that has been created by her . To research for this Blog Hop, I delved into Holly's blog posts and was enjoying the experience so much that, before I knew it, I was back to September! At that point I decided I must call a halt to looking and start creating! Since Holly had gone to the trouble of creating two cards for her project, I decided to follow suit and made a masculine and feminine version although, it has to be said, they look quite different. The masculine card starts with a Cajun Craze base onto which I layered some Pick A Pattern Designer Series Paper and a strip of Wood Textures paper. I overlapped a couple of circles cut with the largest circular Stitched Shapes framelit from Crushed Curry and Cajun Craze cardstock and added some leaves. 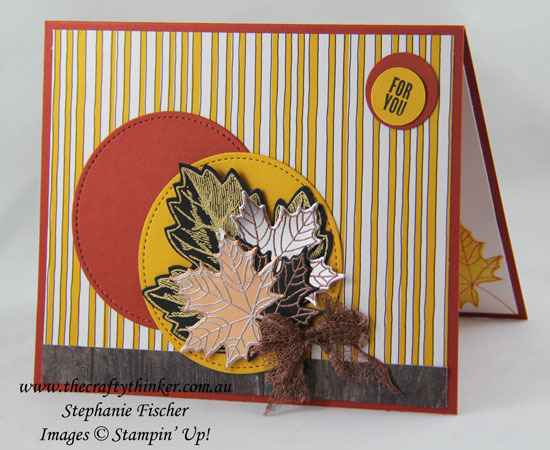 The largest leaf was heat embossed in gold onto Basic Black cardstock with an image from the Vintage Leaves stamp set and cut out with the matching Leaflets framelit. The remainder of the leaves are stamped in versamark with the detailed image in the Colourful Seasons stamp set and heat embossed with Copper, Gold and Silver onto Silver Foil, Basic Black and Copper Foil respectively before cutting with the matching die from the Seasonal Layers Thinlits. The final addition was the little bow using stretched out Copper Trim. The "For You" greeting is from the Tabs For Everything stamp set. I stamped it with Basic Black onto Crushed Curry cardstock then punched it out with the 3/4" circle stamp and layered it, offset, onto Cajun Craze cut with the 1" circle punch. 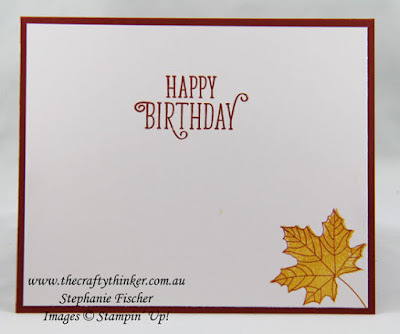 The greeting inside the card is from the Happy Birthday Gorgeous stamp set and the two-step leaf from the Colourful Seasons set is stamped in Crushed Curry and Cajun Craze (which I stamped off first to reduce the intensity). The feminine card starts with a Crushed Curry base (left over from my indecision as to which colour base card to use for the masculine card, if I'm honest!) to which I added two layers of Delightful Daisy Designer Series Paper and a strip of Pool party cardstock to which I added some Night of Navy lines drawn with a Stampin' Write Marker. To echo the swirly motif of the paper, I cut some Night of Navy cardstock with a Swirly Scribbles thinlit. I also cut just the centre of the thinlit from some Pool Party cardstock. I stamped two daisies in Old Olive onto Whisper White cardstock using the Daisy Delight stamp set and watercoloured with Daffodil Delight and (a tiny touch) of Night of Navy ink. Once cut with the matching Daisy punch, I layered them together and added a Gold Faceted Gem to the centre. 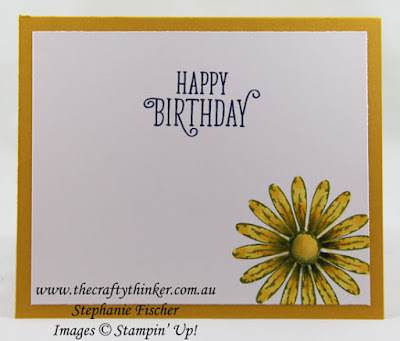 I used the same greeting inside the card, this time stamped in Night of Navy ink and reproduced the flower in the corner by stamping once with the Old Olive ink, rotating the stamp and stamping again (re-inking inbetween). I hope you've enjoyed these cards and I welcome your comments.